The recently purchased album amicorum of Charlotte Johanna Kneppelhout (1779-1842) is an album from Gorcum, but with a Leiden touch. The special collections of Leiden University Library house a large collection of alba amicorum or autograph books. These are primarily affiliated with Leiden University, in the sense that the owners studied or taught in Leiden. In some cases an album has been acquired which has a connection with the city or the university in a different way. The recently purchased album of Charlotte Johanna Kneppelhout (1779-1842) (BPL 3692) is an example of the latter. Charlotte Johanna was the daughter of the Gorcum preacher Johannes Kneppelhout (1745–1803) and the aunt of the eponymous Leiden law student and writer Johannes Kneppelhout (1814-1885), who wrote about student life under the pseudonym Klikspaan (‘Tell-Tale’). The Kneppelhout collection in the library contains works about this Klikspaan (shelfmarks starting with KNEPP). Charlotte Johanna started the album in 1792 at the age of thirteen, when she lived with her father in Gorcum. By then, her mother Johanna van Rijkevorsel (1750-1780) had already died. The album contains inscriptions of her grandmother, father and brother, and many contributions of friends who were mostly from Gorcum and Warmond. The album contains a small number of Leiden inscriptions, including those of Arend Musketier, a merchant residing in the Breestraat. The Leiden touch of this album consists not only of the Leiden contributions and the relationship with the Kneppelhout collection, but also of its binding. 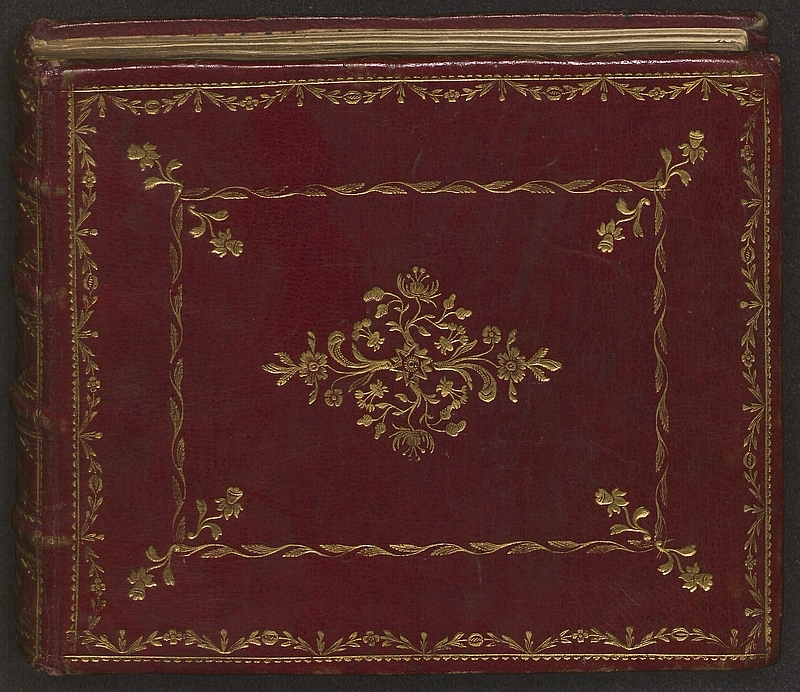 On the basis of the stamps this red morocco binding can be attributed to the so-called ‘Second dissertation bindery’, after the many Leiden dissertations which were bound there in the period 1780–ca. 1794. Thus, this album does not only reveal the network of Charlotte Johanna Kneppelhout, but also something of the early art of bookbinding in Leiden.